The challenges of developing practical, economical offshore wind power are pushing engineers and entrepreneurs to new heights — and depths — of ingenuity. We’ve talked about the pitfalls and potential of offshore wind and other marine renewables for years in our Ocean Engineering Blog. We’ve noted that it’ll never be easy to build technologies that must be submerged in corrosive, turbulent subsea environments. And marine-renewables will remain a tough sell as long as oil prices stay low. The cost of deploying ships and divers to inspect, maintain, and repair cables and other subsea components has been a costly drag on offshore wind farms for decades. Widespread adoption of versatile, low-operating-cost AUVs and ROVs can reduce those costs substantially. As we learned at Subsea Expo 2018 in Aberdeen, Scotland, companies developing advanced AUVs and ROVs are adding new capabilities that, for instance, add a cutting tool to an inspection AUV. Another promising development is underwater charging stations that allow subsea vehicles to roam free without cables. Instead, the stations themselves have cable connections to power sources. GE Renewable Energy’s forthcoming Haliade-X 12-mw turbine underscores the drive to build ever-larger devices that produce more energy in a single tower. Billed as the most powerful turbine on the planet, the Haliade-X will be able to power 16,000 European households with a single turbine. That means a single wind farm of 50 towers could serve 800,000 households — potentially a city of more than 2 million people. Standing 260 meters high with a 220-meter rotor, the Haliade-X will produce 45% more energy than any other turbine on the market, GE says. It’s expected to start showing up in wind farms in 2021. For more on the size challenges in offshore wind, see this profile of former Siemens CTO Henrik Stiesdal in Wind Power Monthly. The prospects for offshore wind farms on floating platforms got a boost in March 2018 when Statoil announced its new floating platform off the coast of Scotland reached a 65% capacity factor for November 2017 through January 2018 — besting a host of competing power sources. That news supports the principal rationale for floating platforms: deploying them farther from shore, where the winds are stronger and more consistent. Capacity factor estimates a powerplant’s output as a percentage of its theoretical energy capacity. Greentech Media noted that U.S. onshore wind farms have a capacity factor of 37%, while coal- and gas-fired power plants have capacity factors of 54-55%. Floating platforms could be the future of offshore wind, but most projects in the next few years will keep using towers anchored to the seabed. Current anchoring methods create an abundance of noise, disturbing sea life and generating concerns about the environmental impact of offshore installations. A new alternative is the suction-bucket foundation, which uses a base shaped like an inverted bucket. It works like this: After the bucket settles on the seafloor, operators pump out all the water inside it, creating a pressure differential that helps fix the bucket in place. When it’s time to decommission the bucket, water can be poured back into it. The first commercial-scale suction-bucket foundation in a wind farm was installed earlier this year off the coast of Scotland, Powermag.com reported. Seabird avoidance. Seabirds have little trouble avoiding the spinning blades of offshore-wind turbines, a new study finds. Windpower Engineering & Development summarized results of the Bird Collision Avoidance Study, which used video cameras and high-tech sensors to track bird movements around a working wind farm in the English Channel. The study analyzed more than 600,000 videos monitoring activity at the wind farm. Of those, about 12,000 showed bird activity. Notably, the videos captured a scant six collisions over the course of the study. Anti-corrosion studies. Offshore Wind Journal reviews reports pointing to potential solutions to the nagging problem of corrosion in subsea environments. The reports estimated that reducing corrosion could generate savings in the tens of billions of dollars throughout the ocean-renewables sector over the next three decades. 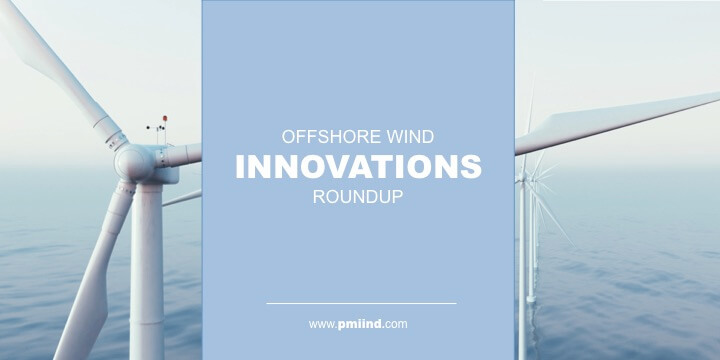 These updates offer just a glimpse of the encouraging developments in the offshore-wind sector. As turbines grow more powerful and engineers figure out new ways to reduce costs and protect subsea ecosystems, it will become ever more realistic to depict offshore wind as an experimental power source with mainstream potential.